TRIVIA: An interesting feature of this container screw cap is its near-perfect dynamic balance. In the course of its manufacture a very small prominence is created at the exact centre of the outer surface. When the cap is inverted and spun on a hard smooth surface, e.g. Formica or sheet glass, it rotates on the prominence. A Bernoulli effect ensures that, except for the prominence, the cap does not contact its supporting surface. It is able to spin for more than 40 seconds. These Fold Farm-Charedi screw caps can thus out-spin any dreidl, both the standard Chanukah dreidls made of wood or clay and the technically advanced high-performance models. 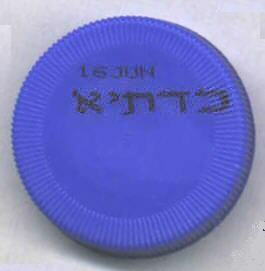 In an informal spin-off, a similar screw cap (DairyBelle milk, South African Beth Din) managed to spin for only about 37 seconds. Source: Charedi Fresh Kosher Milk 1 Litre. Note: The spelling of 'Charedi' is as rendered on the label. Size: diameter = 40mm approx. Comment: The illustration is of the plastic screw cap of a milk container. 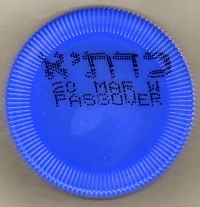 The paper label on the side of the milk container bears the more familiar round Kedassia hechsher.